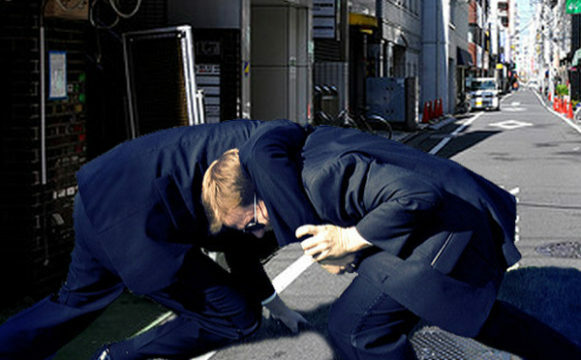 A territorial standoff between two gaijin broke out into a bloody battle yesterday in Meguro 3-Chome. The battle lasted around three minutes with the victor claiming local ward rights and the loser, bloodied and beaten, having to find a new apartment in a different municipality. The larger Meguro 3-Chome gaijin had been scent marking its territory for the past couple of months but this failed to prevent the physical clash. Male gaijin are known for displaying ritualised aggression to intimidate other gaijin from entering their territory such as body posturing and loud vocalizations. Experts say the existence of some choice females in the area may have been the determining factor in triggering the fight. “The male gaijin is especially sensitive to other gaijin getting near any female they know exists,” says Professor Taki Yamada of Tokyo University. We female gaijin always laugh and snicker at worst quality gaijin men that come to Japan! We love to tell all the local women what losers they are back home! I’ve learned that “gaijin” is actually a very offensive word. Literally, it means equal to an alien. Hope more people use “gaikokuzin” to describe a foreigner. Carla Johnson, as a male gaijin myself, and as much as i hate to admit it, but never a truer word spoken.